The ability to predict health outcomes from gene expression would catalyze a revolution in molecular diagnostics. This task is complicated because expression data are high dimensional whereas each experiment is usually small (e.g., ~20,000 genes may be measured for ~100 subjects). However, thousands of transcriptomics experiments with hundreds of thousands of samples are available in public repositories. Can representation learning techniques leverage these public data to improve predictive performance on other tasks? 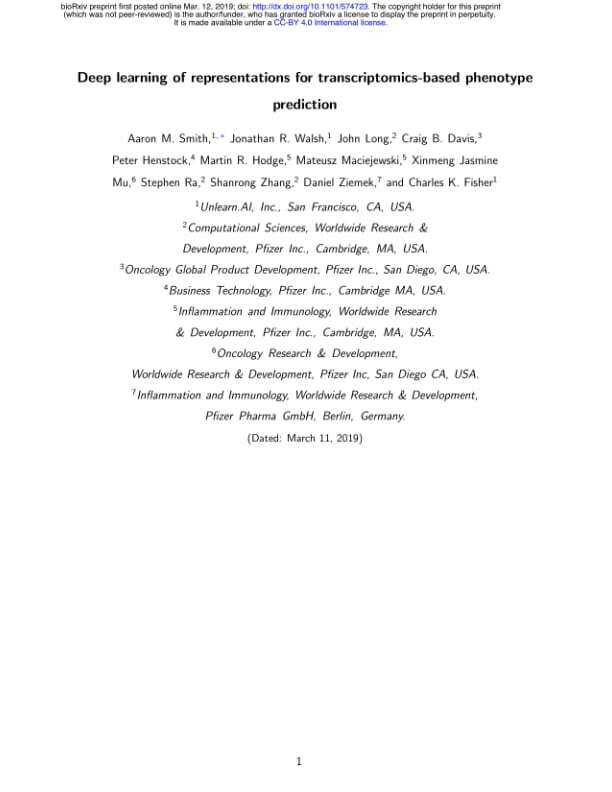 Here, we report a comprehensive analysis using different gene sets, normalization schemes, and machine learning methods on a set of 24 binary and multiclass prediction problems and 26 survival analysis tasks. Methods that combine large numbers of genes outperformed single gene methods, but neither unsupervised nor semi-supervised representation learning techniques yielded consistent improvements in out-of-sample performance across datasets. Our findings suggest that using l2-regularized regression methods applied to centered log-ratio transformed transcript abundances provide the best predictive analyses. Most approaches to machine learning from electronic health data can only predict a single endpoint. Here, we present an alternative that uses unsupervised deep learning to simulate detailed patient trajectories. 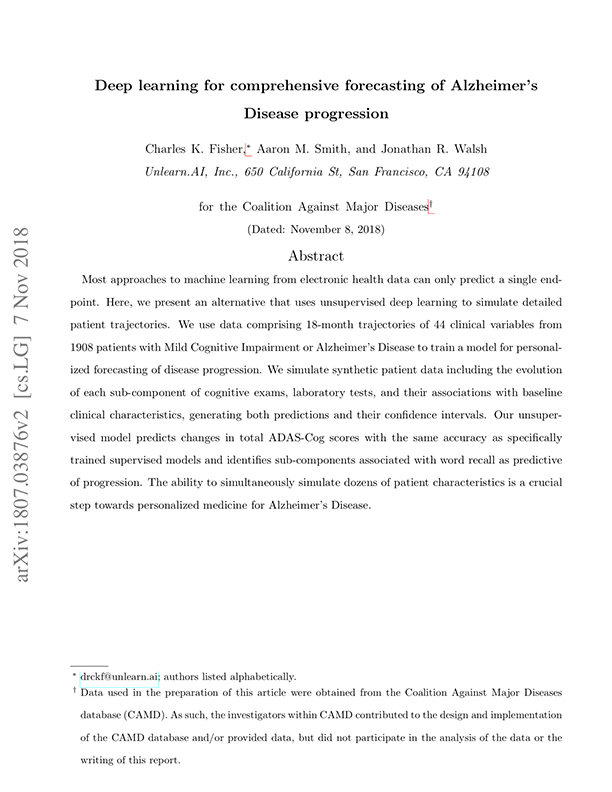 We use data comprising 18-month trajectories of 44 clinical variables from 1908 patients with Mild Cognitive Impairment or Alzheimer's Disease to train a model for personalized forecasting of disease progression. We simulate synthetic patient data including the evolution of each sub-component of cognitive exams, laboratory tests, and their associations with baseline clinical characteristics, generating both predictions and their confidence intervals. Our unsupervised model predicts changes in total ADAS-Cog scores with the same accuracy as specifically trained supervised models and identifies sub-components associated with word recall as predictive of progression. The ability to simultaneously simulate dozens of patient characteristics is a crucial step towards personalized medicine for Alzheimer's Disease. Transcriptional regulation is extremely complicated. Unfortunately, so is working with transcriptional data. Genes can be referred to using a multitude of different identifiers and are assigned to an ever increasing number of categories. Gene expression data may be available in a variety of units (e.g, counts, RPKMs, TPMs). Batch effects dominate signal, but metadata may not be available. 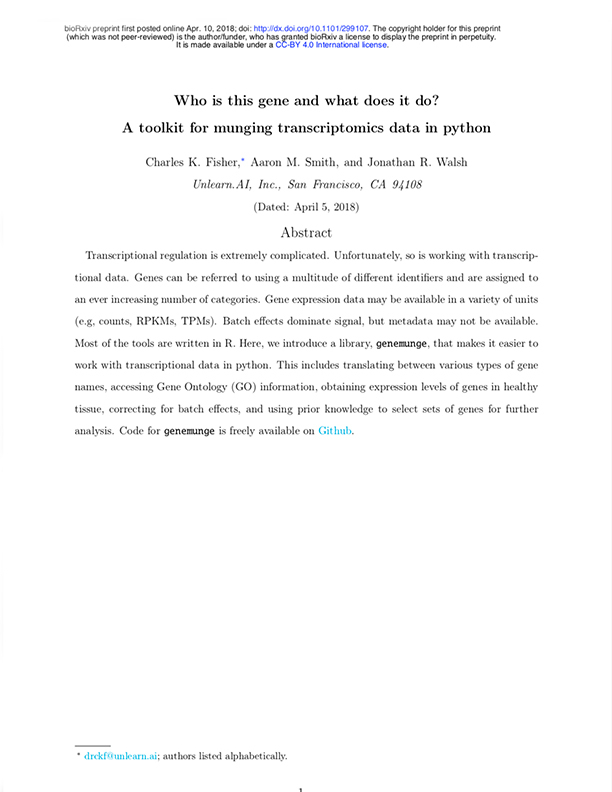 Most of the tools are written in R. Here, we introduce a library, genemunge, that makes it easier to work with transcriptional data in python. This includes translating between various types of gene names, accessing Gene Ontology (GO) information, obtaining expression levels of genes in healthy tissue, correcting for batch effects, and using prior knowledge to select sets of genes for further analysis. Code for genemunge is freely available on Github (http://github.com/unlearnai/genemunge). 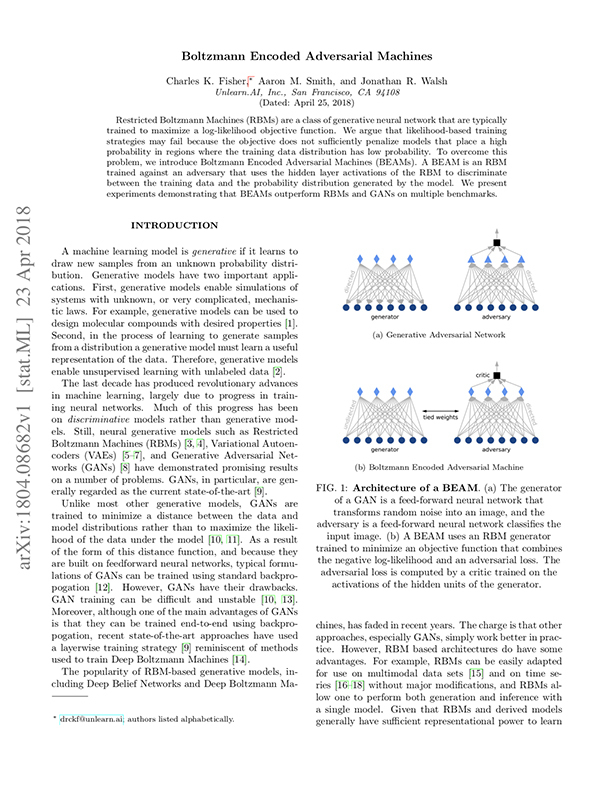 Restricted Boltzmann Machines (RBMs) are a class of generative neural network that are typically trained to maximize a log-likelihood objective function. We argue that likelihood-based training strategies may fail because the objective does not sufficiently penalize models that place a high probability in regions where the training data distribution has low probability. To overcome this problem, we introduce Boltzmann Encoded Adversarial Machines (BEAMs). A BEAM is an RBM trained against an adversary that uses the hidden layer activations of the RBM to discriminate between the training data and the probability distribution generated by the model. We present experiments demonstrating that BEAMs outperform RBMs and GANs on multiple benchmarks.